Guided by Fleur East, the I’m A Celebrity star was challenged to make his way across the treacherous course, as green ants scurried around inside his clothes. The Vamps star took on the challenge hours before another celebrity was due to leave the jungle following a public vote. Morning in camp saw McVey, pop star East and Inbetweeners actress Emily Atack compete to take part in the day’s Bushtucker trial. Only two contestants were needed and McVey and East were eventually selected by Harry Redknapp to take on the challenge. 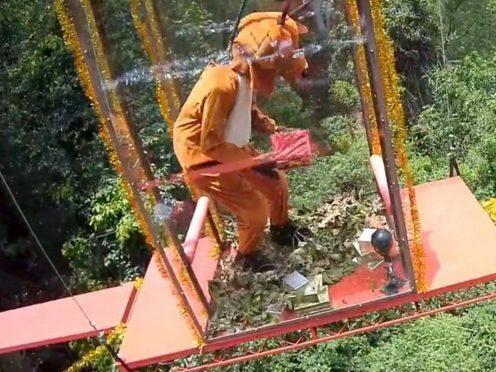 They joined Declan Donnelly and Holly Willoughby in the Bushtucker arena, which had been covered in festive decor. “It’s very Christmassy,” commented East. 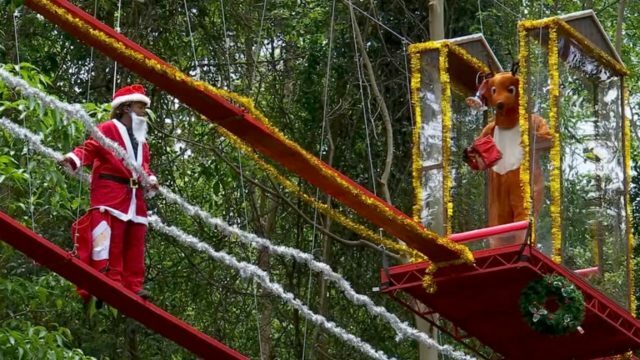 The pair were challenged to complete Ding Dong Merrily Up High, which would see McVey manoeuvre a 30-metre high Christmas-themed assault course blindfolded. In a twist, East was forced to compete dressed as Father Christmas while McVey had to don a suit styled after Rudolph the Red-Nosed Reindeer. Directing from below, East called out commands to McVey to stop him from toppling down. In true I’m A Celebrity style, the course contained boxes of green ants, which scurried into McVey’s body suit when he opened them. On completing the course, and having tossed down his collected stars, East stopped to count their loot. The pair had secured four out of a possible six stars, earning the camp four meals. One more celebrity will leave the jungle tonight, following Anne Hegerty, Rita Simons, Noel Edmonds, Malique Thompson-Dwyer and Sair Khan. I’m A Celebrity… Get Me Out Of Here! continues on ITV.